Cultural Diversity Week is 18 to the 25 of March – a week-long program of festivals and events, which celebrate Australia in all its cultural diversity. 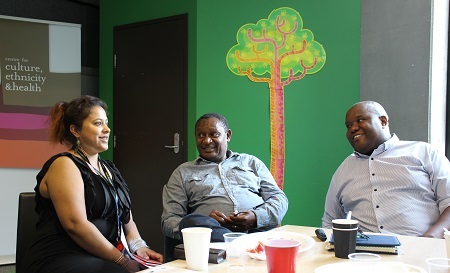 As part of the week, on Saturday the 17 of January, CEH ran a forum aimed at Culturally and Linguistically Diverse (CALD) communities focussing on grant writing and an Alcohol and Other Drugs (AOD) forum. Some of the main issues raised included a lack of education about alcohol for migrant and refugee groups, difficulty accessing health services that are sensitive to their needs as recent arrivals, as well as the lack of targeted information for these communities. An MCAN member noted that prior to arriving in Australia, many migrants and refugees may never have been exposed to alcohol. This means that individuals may not be aware that certain substances are much stronger than others. They may also not know of the short-term and long-term effects of alcohol abuse and the associated risks such as unplanned pregnancy, violence and STIs. Another barrier to equitable health for the CALD community is that many migrants and refugees do not feel comfortable accessing AOD services. In many cultures, there is a stigma around alcohol. CALD community members who require support will often not seek out AOD services because of fear of judgement and shame. These issues confirmed the need for an integrated Multicultural Drug Support Service. This Service differs from other Drug Support Clinics in that it proposes to be an outreach in-home model of care. CALD community members could then access AOD support without worrying about some aspects of stigma. Another benefit of the mobile service is that it assists families, not just individuals, who require education and support. You can sign the petition for this Multicultural Drug Support Service here. Some of these community health issues also came up in the grant writing workshop. CEH ran this hands-on session to provide M-CAN members with grant writing tips and tricks. A guest speaker from the City of Yarra also spoke about council grant programs. Those who attended the Forum and Workshop were then eligible for up to $2000- in community grants. Prevention, treatment and resource development for blood-borne viruses, fighting racism in healthcare and improving health communication were among the subjects M-CAN members wished to address through the grant. Through the workshop and forum, strategies and services were outlined, to help those dealing with AOD problems. The session proved an invaluable way to shape CEH’s approach to CALD community health, particularly regarding blood-borne viruses and alcohol use. We look forward to letting you know more about the Multicultural Drug Support Service and the grant recipients as they are awarded in the coming months.